Should you go with Bluetooth or Wi-Fi speaker? What are the most important features you should pay attention to when buying wireless outdoor speaker? If you’ve been struggling to find the best wireless outdoor speaker for your needs you’ve come to the right place. We know it sounds a little bit pretentious, but keep reading our article on 15 best wireless outdoor speakers and we assure you that you will find here all the necessary info you have to know before buying the right wireless speaker. Bluetooth is an omnipresent technology used in a bunch of different devices (smartphones, players, PCs, tablets, iPhones, iPads, etc.) and the market is flooded with all kinds of speakers that support a Bluetooth wireless connection. 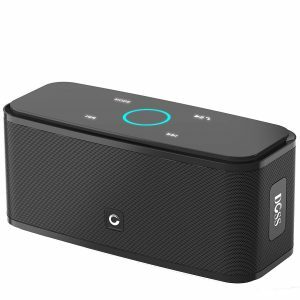 In terms of compatibility, Bluetooth speaker is definitely better option than Wi-Fi speaker because you can connect it to all sorts of Bluetooth-enabled devices. This is not the biggest advantage of Bluetooth speakers, especially when talking about those for outdoor use, but it’s important. If you decide to buy a Bluetooth speaker you will almost certainly connect it to any device. Connecting your phone or your PC to a Bluetooth speaker is much easier than connecting to a Wi-Fi speaker, and most of Bluetooth speakers don’t require installing any additional apps (although, there are some speakers like JBL or UE speakers that require an app for some purposes), while almost every Wi-Fi speaker must be controlled with an app. The biggest advantage of Bluetooth speakers, especially when talking about outdoor speakers is that they have lower power consumption so they can be powered by battery and last much longer per one charge than any Wi-Fi speaker. The battery is one of the crucial things if you want to bring your speaker with you when going to the beach, to the pool, or anywhere else. The other big flaw of the Wi-Fi speakers opposed to the Bluetooth speakers is that they need to be connected to the Wi-Fi network (usually your home network), and your phone, PC, or any other device you use, has to be connected to the same network in order to stream the music. If you are somewhere outside (away from your home), your Wi-Fi speaker won’t be useful (even if it is battery-powered) because there will be no Wi-Fi network to connect to. But, if you if you want to throw a barbeque party (or any other party), then Wi-Fi speaker might be a great option, you just need to find the right Wi-Fi speaker. Now that we know all the advantages of Bluetooth speakers, let’s talk about some Wi-Fi speakers’ advantages. There are two main advantages we are going to mention – range and sound quality. Wi-Fi speakers have significantly larger range than Bluetooth speakers. In order to enable continuous playback, you will usually have to be within 30ft range if you use a Bluetooth speaker. If you use a Wi-Fi speaker you can be as far as 150ft away (or more) and still get a good signal and uninterrupted playback. So, if you are throwing a party in your backyard, you can bring the speaker along with your phone outside and leave your router inside and stream your music flawlessly. The other, and probably the most important thing that makes Wi-Fi speakers so good is the sound quality. Wi-Fi connection enables much greater bandwidth and bitrate than Bluetooth connection, and that’s why the output sound is much better. With Wi-Fi speakers, you will have the opportunity to stream high-fidelity audio, while every data (and audio) that comes through Bluetooth speakers has to be compressed and due to this compression sound quality is not as great. Another thing worth mentioning (although it’s not closely related to our topic) is multi-room experience that you can get with Wi-Fi speakers. Some Bluetooth speakers can be connected into an audio system (you can connect 2 or even 50 speakers, depending on the model) and you can put them in different rooms of your house to get a multi-room system. They are, unfortunately, far from great for this purpose – they simply won’t sync with each other and you will constantly hear something like an echo. If you want a speaker that could be used as part of multi-room system, you should go with Wi-Fi speaker (and for a multi-room system you will have to buy the same model for every room) because they synchronize with each other much better than Bluetooth speakers. During the last two or three years, smart Wi-Fi speakers became widely popular, but most of them are not designed for outdoor use, so don’t expect some Sonos or Google home speakers here but you can try to find some Wi-Fi speakers that also have Bluetooth technology built-in and that can be used indoors or outdoors. There are some pretty good speakers of that kind on the market – Libratone ZIPP, UE BLAST, GGMM E5, etc. So, to conclude this part on Bluetooth VS Wi-Fi, if you want to use your outdoor wireless speaker everywhere, not only in your backyard or around the house, you should buy some Bluetooth speaker, and we have found plenty of great options, you just have to pick the right one for you. 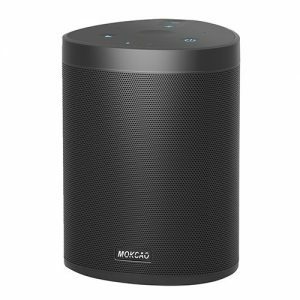 If you want a multipurpose speaker that could be used outdoors (with Bluetooth technology and battery), but can be also connected to your home network (whether you want to use it as part of a multi-room system or you just want a better sound quality) than you should buy a Wi-Fi speaker with enabled Bluetooth functionality. In this article, we will talk about Bluetooth speakers only, and one of our future articles will be dedicated to Wi-Fi speakers with Bluetooth function. These are our reviews of 15 best wireless outdoor speakers in 2019. MOKCAO is one of many young audio companies on the market. It’s less than 1 year old, and it already managed to find its audience. Some of their models remind us of some other models made by some well-known manufacturers (like Harman/Kardon), but maybe that’s just our impression. 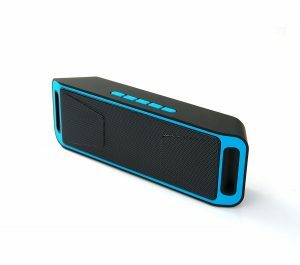 We’ve decided to present to you their outdoor Bluetooth speaker SoundBoom. This is not the cheapest product on the list, but it’s not that expensive either. Most of the customers would find it affordable, and it is one of the best choices for less than $40. SoundBoom Bluetooth speaker comes in a simple white box with some illustrations on it. The size might make you think that the speaker is bigger than it really is, but don’t worry, it’s not that big. Inside the box, there is instruction manual, charging cable (it’s not micro USB cable, which is kind of a standard for Bluetooth speakers), and an auxiliary cord. The speaker is not too big, but it definitely isn’t mini speaker. It’s 6.7 inches tall, 4.9 inches wide, 4.9 inches deep, and it weighs 2.4 pounds. The top and the bottom are covered with rubber while all the other sides are reinforced with strong aluminum mesh that protects the drivers. The control buttons are on the top – there are power button (you have to press and hold it for a few seconds to turn on the speaker, and pairing starts automatically), play/pause button, and two volume buttons (you can press and hold them to adjust the volume, or press and release to change the track). All the buttons are soft and made of silicone and they really feel nice. At the back of the speaker, there is narrow rubberized spine (let’s call it like that), and on that rubberized spine, there is rubber handle at the top and rubber flap that protects the line-in (audio) port and charging port at the bottom. Some really powerful drivers are packed inside this small, nice-looking speaker. You can find inside 20W subwoofer, 10W tweeter, and two passive radiators inside the speaker, so you can immediately conclude that this speaker is heavy on bass. This kind of speakers usually don’t have subwoofers, but this features one pretty strong subwoofer. We honestly find this little speaker visually appealing. Many affordable speakers don’t have such an attractive look, but SoundBoom is really sleek and stylish. It’s oddly shaped, it looks like triangular prism with rounded edges, and it is available in two colors – black and white. SoundBoom is well-built with bunch of reinforcements and strong metal mesh that covers the most of the speaker. The speaker is still not rugged enough to be considered shockproof so don’t drop it. Thanks to all the rubberized parts and protective mesh with really small holes along with protective fabric behind the mesh, SoundBoom is splash-proof and has IPX4 rating, so it can withstand some light rain, but can’t be submerged in water. SoundBoom exploits Bluetooth 4.0 and can work with practically any Bluetooth-enabled device. Advertised range is 33ft, and our experience confirms that the connection is stable up until 30ft. The Bluetooth connection is so good that there is no noticeable sound delay when watching movies on your tablet, iPod, or iPhone. Well, this could easily be a downside if this speaker wasn’t so strong and loud. Battery offers up to 5 hours of playtime at 50% volume, which doesn’t seem so impressive, especially when you crank the volume up to the maximum. You should know that this one is definitely strong and loud enough even at 50% volume, so you really don’t have to increase the volume unless you are throwing a party. That’s why we decided to include the battery among the good things about SoundBoom. SoundBoom has not one, but two built-in mics, and talking with someone through this speaker is very easy. These mics do a really good job at canceling environmental noise, so the person you are talking with can hear you loud and clear. Even some more expensive speakers are not as good as SoundBoom when it comes to the speakerphone function. SoundBoom offers incredibly strong, bass-heavy sound, with crisp vocals, and pretty clean highs. There is barely noticeable distortion at maximum volume, but it really doesn’t make it less impressive, and probably the best in its price range (under $40). SoundBoom also offers 360-experience thanks to the drivers’ arrangement. The sound is not perfectly distributed in all directions, but it’s more than satisfying. This is not such a big flaw, but you should know that there is slight deviation from the standard. You can only charge the battery if you have a wall socket nearby, and you can’t charge it via USB port on your computer. We’ve already elaborated this issue. The speaker is solid and strong, but not reinforced enough to be shockproof so you have to pay a little bit more attention and try not to drop it accidentally. We think that AOMAIS and previously mentioned MOKCAO are basically the same company and there are many proofs for that, you can visit their websites and see the same ‘’About Us’’ section. We have no idea what’s the reason for making the same type of products under two brand names, but there is probably some marketing strategy behind this kind of approach. It’s maybe unfair to customers (and maybe a little bit confusing), but this is not the first and only example. So, everything we said about MOKCAO applies to AOMAIS – in short, they make affordable Bluetooth speakers with more than satisfying build and sound quality. The first AOMAIS speaker we are going to present to you is their AOMAIS Ball. AOMAIS Ball comes in an ordinary cardboard box with a couple of illustrations on it, and for this kind of price, you can’t really expect something flashy. Along with the speaker, you will get micro USB charging cord, auxiliary cord, instruction manual, and a silly-looking floaty which you can use at the pool because the speaker itself doesn’t float. AOMAIS Ball is one of the coolest-looking speakers in this price range, it’s round-shaped with 5.5 inches diameter (pay attention to the dimensions, some pictures might make you think that it is bigger than it really is) and it weighs only 9 ounces. The front is covered with sturdy aluminum mesh, there is discreet AOMAIS logo at the bottom, and the back is rubberized. There are only three control buttons at the back – power button (pairing starts automatically when you turn on the speaker), and two volume buttons. At the bottom of the rear panel, there is a rubber flap protecting the micro USB charging port and line-in port. At the top of the speaker, there is nylon strap, and you can connect carabiner to it and hang the speaker in your bathroom, or wherever you like. Inside the speaker, there are two drivers one tweeter and one woofer with combined power of 15W, which is more than we’ve expected from this small speaker. As we’ve mentioned previously this is one of the most elegant and sleek speakers in this price range. The design is definitely one of the best things about AOMAIS Ball and there is really small possibility that you won’t like it. The speaker is available in 3 colors – black, blue, and red. The speaker looks really strong and sturdy, it’s not exactly shockproof, but in our opinion, it could withstand some beating. Previous customers were really happy with this speaker’s durability, and there were no complaints, at least for now. The speaker is completely waterproof, which is not something you can usually expect from such a cheap speaker. You can immerse it in the water up to 1m deep for 30 minutes. We have spilled a bottle of water on it, and the sound remained unchanged. AOMAIS Ball features Bluetooth 4.2 which works flawlessly. Pairing takes about 3 seconds, it starts automatically, and the Bluetooth range is some 30ft, which is pretty much standard distance. We have some small complaint about the process of connecting two speakers together, but you can read about that later. AOMAIS Ball has decent battery for its size, battery capacity is 2,500mAh and it can offer up to 8 hours of playtime at 50% volume, and around 3 hours at maximum volume. This is not perfect, but for less than $30, you can’t expect perfection. AOMAIS Ball speaker can be connected to another Ball speaker. Pairing two speakers together is not that simple, but when you manage to pair them, you will be very happy. The sound is much louder, it’s more natural, and with more bass. The speaker allows you to answer calls thanks to built-in mic. Your voice on the other end won’t be perfectly clear, but it will still be clear enough so the other person can understand everything you say. Talking in noisy environment is definitely a problem because the mic picks up a lot of noise. AOMAIS Ball offers decent sound quality, vocals and guitars are crisp, highs are pretty clean, but the speaker lacks some bass. The bass is definitely present but should be a little bit punchier. Considering the price, the sound is satisfying, but nothing more than that. Connecting two AOMAIS Ball speaker is a great thing, and when they act as separate channels, the sound is much better, but there is very strict procedure you have to follow. There is no dedicated button for pairing two speakers into a stereo system and you have to disconnect your speaker from your phone and turn off the speaker you’ve been using previously. Then you should turn on both speakers and let them pair with each other first. After they pair you can pair your phone with a master speaker. The only problem is that you will see two AOMAIS speakers with the same description so you will have to guess which one is master speaker. The process of pairing two speakers is kind of confusing and should be much simpler. If you have very limited budget and you need something slightly louder than your phone’s speaker (nothing more than that) than here is the right choice for you. NEWBEING S5 is one of the cheapest Bluetooth speakers on the market, and you can buy it for less than $20. Of course, you will have to lower your expectations, because you can’t get great quality for this kind of price. NEWBEING S5 comes in a modest cardboard packaging along with micro USB cable for charging, auxiliary cable, user guide, and 2 years warranty (which is kind of surprising for a cheap speaker). The speaker is completely made of plastic, the front side is covered with aluminum mesh that doesn’t really feel strong enough. 5 control buttons are on the top – you will find there track changing buttons (also volume buttons), play/pause button, mode button (use it to shift between Bluetooth mode, AUX mode, micro SD card, USB, and FM mode), and handsfree button. At the back, there is bunch of ports – USB port (can’t be used for charging your phone but only for playing music directly from USB flash drive), 3.5mm port, micro SD card slot, and micro USB charging port. You will also find a small plastic ON/OFF switch there. The speaker is very small and lightweight – it is 8 inches wide, 2.6 inches tall, 1.9 inches deep, and it weighs 12 ounces, so you can bring it with you wherever you go. Inside the NEWBEING S5, there are two 40mm drivers with combined power of 6W (so it is not really that strong, but for that kind of money, you can’t expect anything stronger) and one passive radiator in the middle. Well, it’s not like this speaker could compete with some other slightly more expensive speakers in terms of design, but it’s not repelling. It looks like some kind of toy, and it is available in five different colors – orange, blue, green red, and gray. NEWBEING S5 features Bluetooth 4.1, and pairing is very simple and quick. Bluetooth range is much shorter than advertised (around 15ft) but there are some much more expensive speakers on the market with a similar problem, so we don’t think this is a big issue. We have tried to pair the speaker with Android phone and iPhone 6, and there were no compatibility issues. Some previous customers complained that it doesn’t work with newer iPhone models. This speaker has lithium-ion battery with 1,800mAh capacity. The battery can offer up to 10 hours of continuous playback (in Bluetooth mode) at 50% volume, and this is great for such a cheap speaker. Recharge takes around 4 hours. For a cheap speaker, this one has an incredible number of additional features. You don’t have to use Bluetooth connection to stream the music, you can use micro SD card or USB flash drive (up to 16GB). There is also built-in mic so you can take calls with it, but the mic is far from perfect and talking with someone is really not that easy, but you can understand the person you are talking with clearly and that person will eventually understand what you are talking. There is also built-in FM function but we are not happy with it and you can read about that in the next section. NEWBEING S5 delivers slightly better sound than we expected. Mids and highs are not perfect, but articulate and clean enough, while the bass is pretty much weak, almost non-existent. There is also noticeable distortion at maximum volume but if you don’t go over 85% volume, there will be no distortion. The speaker is louder than expected, but still, the combined power of two drivers is 6W, so this is definitely not a speaker that could fill the room with sound. As you already know. Every single part of this speaker is made of plastic, so you can’t expect great durability. That’s why we are a little bit confused with the warranty period of 2 years. The speaker feels cheap, plastic is thin and fragile, and we really don’t think that this kind of speaker could last that long. The speaker also doesn’t have IPX rating and any contact with water can be fatal. If you want this speaker to last, don’t bring it with you to the pool or to the beach. NEWBEING S5 also features FM radio, but we couldn’t make it work. We’ve tried all kinds of things but without any success. Many customers complained about this function and we don’t think that we made some kind of mistake. FM radio function is useless and you should be aware of that, especially if you want to buy it because of this function. Unlike some previous manufacturers, COWIN is already well-known name in the world of audio industry, especially when it comes to Bluetooth speakers. COWIN is not a company with great and long tradition like SONY, Bose, or JBL, but it has been on the market for more than 10 years and it showed that it is more than capable enough to compete with these famous brands, especially when it comes to COWIN premium models. The speaker we want to present to you is definitely not premium, but it offers pretty good price-quality ratio. It is perfect for the pool, and all the flashy LED lights on the top make it great choice for children. Here is our review of COWIN Swimmer Bluetooth speaker. COWIN Swimmer comes in an interesting colorful box (it’s like the presentation was made for children, but the grownups can have lots of fun with it, too). The packaging is not rich, there is only speaker, micro USB charging cable, and instruction manual. That’s it, nothing more. You can buy separately a floating ring but the speaker can float even without the floating device. Still, you should think about buying the floaty because of some issues we noticed, but we will elaborate on that later. The speaker reminds us of an alien spaceship from some old cartoon, and all the LED lights on the top make it even more similar to a spaceship. The speaker is not that big – it is 6.8 inches tall, it has diameter of 6.9 inches, and it weighs 1 pound. The control buttons are on the top, right next to the LED panel. There are five control buttons –two volume buttons (you can also use them to change tracks), power button, play/pause button, and light show button. On the side of the speaker, there is small gasket that protects micro USB charging port and micro SD card slot (which you can also use and play the music directly from the micro SD card, especially if your Bluetooth device is out of range). Inside COWIN Swimmer there is one 10W driver with three passive radiators for improved bass response. We can’t help but think about the old cartoons and alien spaceships in those cartoons whenever we look at this speaker. LED lights on the top are nice additional detail, and they can make a great disco atmosphere. COWIN Swimmer is not stylish, elegant, or sporty, it basically looks like it was made for kids, but we still like it very much. COWIN Swimmer is compact and sturdy but it doesn’t feel rugged enough. It can definitely survive heavy use, but if you accidentally drop it on some hard surface (asphalt, or kitchen floor), it might be fatal. The drivers inside the speaker are sealed, just like all the ports, which make this speaker waterproof and submergible. You just have to pay attention to the rubber gasket that protects the ports and always keep it well-sealed because it’s below the floating line of the speaker (the better option was to place it above the floating line, but still, if you seal it well, there will be no problem). You should know that this speaker can float, so you can literally bring it with you in the pool and swim around it. COWIN Swimmer features Bluetooth 4.0 which works fine, but it is definitely not as advertised. Pairing is easy and fast, but the Bluetooth range, especially if the speaker is in the pool is much shorter than 30ft (some 15ft max) so you would have to leave your phone or PC nearby. Any wall or other obstacles can shorten the range. We haven’t experienced compatibility issues; the speaker works fine with Android phones and iPhones. If we got this right, this speaker features two 1,200mAh batteries (one for the drivers and one for all the LED lights, we assume). The battery is not so large, but since the speaker itself is relatively small, 1,200mAh is just enough for 9 hours of playback time at 60% volume. Recharge will usually take 2-3 hours. We’ve already mentioned all the LED lights on the top (32 lights to be precise). You can choose between 5 different modes, they all look flashy and fun, so we don’t really have any favorite. Light-show can really improve the atmosphere and we honestly love them. If you experience some connectivity problems when you are in the pool, you can always use micro SD card and play the music directly from it. In our opinion, this is probably better option when you are in the pool – there will be no cutting out or connection loss. For its size, COWIN Swimmer delivers pretty loud and well-balanced sound. There is definitely some bass although it gets slightly distorted at maximum volume. Vocals are crisp and clean, but highs lack some clarity. We are pretty happy with the sound this speaker provides but only when the speaker is on the table. The moment you bring it with you into the pool, you will understand its biggest weakness. If you splash just a little bit water on it, and that’s inevitable, the sound gets muffled. The speaker doesn’t get damaged and when you remove the water, the sound comes back, but it is still annoying. That’s why COWIN offers a floaty, which you can buy separately. The idea is to put the speaker inside this floating accessory and protect it from all the water. The speaker will definitely deliver better sound that way so you should consider buying this floaty if you want to use the speaker in the pool. People rarely keep their phones near the pool so it would be nice to have a speaker with handsfree function, but COWIN Swimmer doesn’t have it. On the other side, it’s questionable what kind of experience would be talking on the phone while swimming so it is maybe better not to include handsfree function. You decide whether this is good or bad thing. DOSS is almost 20 years old company, and it is well-known name in the audio industry, but the people from DOSS decided to start their own line of Bluetooth speakers only recently. In 6 years period, DOSS managed to earn its place on the market. This is one more company with similar business strategy like the previously mentioned COWIN, AOMAIS, or MOKCAO – they all make affordable products and offer decent quality. The final product is definitely not perfect, but you will be happy with what you get. DOSS Touch comes in a regular, cheap-looking cardboard box, without any sign or logo on it. You basically don’t know what is inside until you open it. Inside this box, you will find your speaker, micro USB charging cable, an auxiliary audio cable, small carrying pouch (which doesn’t look great and doesn’t offer great protection – there is hard carrying case available, but you will have to buy it separately) and instruction manual. DOSS Touch is another boxy speaker, it looks like many others you’ve already seen. It is 6.6 inches wide, 2.9 inches tall, 2.7 inches deep, and it weighs only 1.2 pounds, so it can be considered small or even mini. Everything besides the top and the bottom is wrapped with black metal grille. The grille is flexible and doesn’t seem very strong, but still offers decent amount of protection. At the bottom you will see four rubberized feet that keep the speaker in place, and at the top, there is touch-sensitive control panel with one circular button in the middle (volume controls), and 4 other buttons around it (forward and rewind buttons, mode button, and play/pause button which is also a handsfree button). All the input ports are at the back – there are line-in port, micro SD card slot, micro USB charging port, and power button. DOSS Touch has two 6W drivers, they are facing forward so there will be no 360-sound, and between these two drivers, there is one passive radiator for enhanced bass response. Like we’ve said, there is nothing really special about this speaker, but it is still stylish and elegant, and those touch-sensitive buttons look really interesting when you power the speaker on. DOSS Touch is available in 4 colors – black, white, red, and blue. DOSS Touch features Bluetooth 4.0, and pairing with any Bluetooth-enabled device goes without any problem. Advertised Bluetooth range is 33ft, but in reality, it is more like 20ft. DOSS Touch can memorize one device (the last one that was used) and it will pair with this device every time they are 20ft or less from each other unless you erase your device from the speaker’s memory. If you have non-Bluetooth device, there is always audio input so you can connect that device physically to the speaker via 3.5mm audio cable. You can also use micro-SD card with this speaker, and play the music from it (in case your phone dies, or if the Bluetooth range is not satisfying). Of course, there is no display, and that’s a minor setback, but you will have to live with that. For a small speaker, DOSS Touch has pretty large battery. 2,200mAh battery is powerful enough to provide 12 hours of continuous listening to music at 70% volume. If you listen to music at max volume (which is not a great experience considering the distortion, but we will talk later about that), you will get 4-5 hours of playtime. You will need some 3-4 hours to recharge the battery. Built-in mic works pretty well when you are inside your house, but it’s not that great outdoors. There is a certain amount of static noise when using the built-in mic so the person you are talking to will be struggling to understand you. DOSS Touch offers pretty good balance between low, mid, and high frequencies, but only when you listen to music at moderate volume. If you crank the volume up, the distortion becomes more noticeable. The separation between left and right channels is not perfect and you won’t get great stereo sound, but it is still much better than many speakers in this price range. The speaker is mostly made of plastic and aluminum mesh covers the front and back, as well as the right and left side of the speaker. DOSS Touch is not extremely fragile, but it still doesn’t seem rugged enough. You will have to be really careful with it and we have no idea if it would survive accidental dropping on some hard surface. If you use it carefully, then it will probably last for a year or two, but we don’t expect it to last more than that. DOSS Touch also doesn’t have IPX rating and because of the touch-sensitive panel, it shouldn’t be exposed to water. When you crank the volume up, DOSS Touch produces too much bass for its small size, and as a result, distortion appears. In order to avoid this, try not to listen to music at maximum volume. Vtin is relatively new audio company specialized in Bluetooth headphones (especially for sports) and speakers (especially rugged and waterproof speakers). 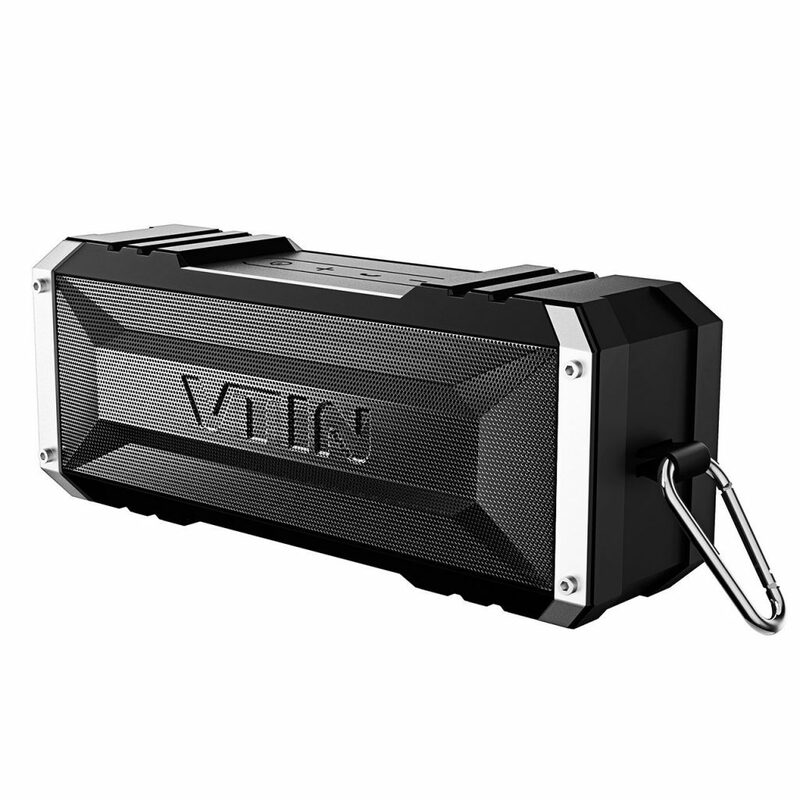 Vtin Punker outdoor speaker we are presenting to you is the perfect example of a strong wireless outdoor speaker that you can use in many different situations and one of the greatest under $40. Vtin Punker arrives in a regular cardboard box with technical specs on the front side, so nothing flashy or colorful. Inside the box, there is a speaker, an auxiliary audio cord, charging cable, metal carabiner (so you can hang your speaker in your garage, or in your bathroom), and instruction manual. The first thing you will notice about this speaker is that it feels very rugged and very strong. It is mostly made from ABS with rubber covering and combination of metal and rubber along the edges. The front and rear panels are protected with strong and inflexible black metal mesh. There are four control buttons on the top – 2 volume buttons, ON/OFF button (pairing starts automatically when you turn on the speaker), and handsfree button. There are also a built-in mic and small LED light on the top. Micro USB charging port and auxiliary 3.5mm port are on the left side and there is strong rubber flap protecting them (rubber flap might be hard to open, but you should keep trying and it will come out eventually). On the opposite side, there is rubber hook, and you can attach metal carabiner to it and then hang this speaker wherever you like, indoors or outdoors. Vtin Punker is small and portable – it is 7.1 inches wide, 2.8 inches tall, with 2.1 depth, and it is 1.4 pounds heavy, so you can bring it with you everywhere. This is perfect choice for hiking, camping, cycling, or any other outdoor activity. You can even bring it to the pool, but be aware it is only splash-proof, and it can’t survive full immersion in water. Inside the speaker, there are two 10W drivers facing forward, and one passive radiator for improved bass response facing backward. This speaker doesn’t really look stylish or elegant, it looks sporty and more like part of mountaineering equipment with all those rugged build and metal carabiner. It is available only in black color, and you can choose whether you like silver or completely black metal parts. Build quality along with battery is the best things about Vtin Punker. It is so strong and based on all the things that other customers say, this is one of the most durable speakers on the market, probably the best in this price range. The speaker also has IPX4 rating and it is splash-proof, but it is not waterproof like the manufacturer likes to say. Pay attention to this issue – bunch of manufacturers claims that their products are waterproof, while in fact, these products have waterproof rating below IPX7 (which is the only thing to look for if you really need waterproof speaker). Vtin Punker can’t be fully submerged and you can find the note in the instruction manual that says that this speaker is only splash-proof. The only thing that bothers us is that the manufacturers write in huge letters that it is waterproof, and then leave a small note that it has IPX4 rating. Anyway, this small issue doesn’t change our impression about this speaker – splashes of water or rain won’t damage it, and that’s the important thing for an outdoor speaker. Vtin doesn’t provide any info on Bluetooth version, but everything looks pretty much standard – pairing works flawlessly, range is about 30ft, it works with Android phones and iPhones, we didn’t experience any issues regarding connection – it’s very stable and without signal loss. If you have non-Bluetooth device, there is always auxiliary audio input and you can use aux cord to connect your device (mp3 player, or whatever) to the speaker. We have said this earlier, but it doesn’t hurt to say it again. The battery on this thing is great. It has capacity of 4,400mAh and it allows up to 30 hours of listening to music at 50-60% volume (manufacturer claims that you can listen to music at 65% volume, but our experience is different). You will probably get some 7-8 hours of playtime at full volume. It takes 5-6 hours to fully charge the battery. Like with many other Bluetooth speakers (especially those affordable speakers), handsfree function is not great. Built-in microphone is good for indoor use and not so great for outdoor use. If the sound quality on this one was as good as the battery, this would be a great speaker. Unfortunately, the sound is only good for the price. Don’t get this wrong, this speaker can really get loud for its size, the separation between left and right channel is decent, and there is definitely some bass, but the sound is far from perfect. On the other side, the speakers that offer great sound are much more expensive, so for the price, we can’t really complain. The bass is there, it is not as strong and punchy as we would like it but it is present, vocals are clean, while the highs really lack some crispness. There is also some distortion at high volumes. Well, this is not something that we have experienced, but rather something that a few other customers experienced after some time of use (usually more than six months). It turns out that the part where micro USB charging port and line-in port are placed is made of thin plastic and it can be broken easily. Not many customers complained about this issue, but we think that you should be aware of it. Etekcity is relatively well-known e-retailer, and like always, we were skeptical about the quality of a product made by company that is not specialized in audio equipment exclusively, because their products usually don’t meet our expectations. 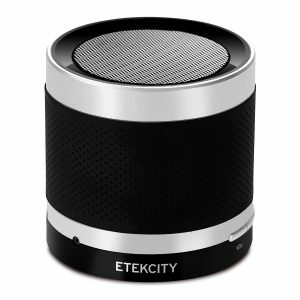 Etekcity RoverBeats T3 is one of many cheap mini speakers on the market, and considering the price, it really offers more than you could possibly expect. Inside a simple cardboard package, you will find RoverBeats T3 Bluetooth speaker, an auxiliary audio cable, micro USB charging cable, carrying bag, and instruction manual. RoverBeats is really small cylindrical speaker. It looks almost the same like some mini speakers we mentioned in some of our previous articles (EasyACC, for example). The speaker has 2.5 inches in diameter, it is 2.6 inches tall, and it weighs only 6 ounces, so you can bring it with you everywhere – it fits your bag, your suitcase, your backpack, even your pocket (but it has to be a little bit larger pocket). As we’ve said, the speaker looks like cylinder and the driver is faced upwards – that’s why there is black metal mesh on the top. The big part of the speaker is covered with some rubbery material that makes it easier to hold. The bottom and the top are made of glossy plastic, and all the controls and ports are near the bottom. You will see power switch button, micro USB charging port, 3.5mm audio port, built-in mic, 2 volume control buttons, and play/pause button (which is also a handsfree button). There are no buttons for skipping tracks. The bottom is covered with some sticky material that prevents it to move around. This sticky material is probably too strong, it’s almost like we glued the speaker to the table. Inside the speaker, there is one small 3W driver with passive radiator, so you shouldn’t expect great loudness and perfectly clear sound, but it actually performed better than we expected. Well, this is not something that you haven’t already seen, there is bunch of similar speakers on the market. This one doesn’t excel when it comes to design (especially when you compare it to some more expensive speakers like SONY XB10) but it is still visually appealing. It’s available in black and silver color combination, and that’s your only option – if you don’t like it, just move on to the next speaker. RoverBeats T3 features Bluetooth 4.0, pairing is easy and fast, and connection is stable. Bluetooth range is around 30ft, and we haven’t experienced any signal loss within this range. The speaker can be paired with all phones, PCs, tablets. Non-Bluetooth devices can be connected also because there is line-in port and you get auxiliary audio cable with the speaker. We don’t know what’s the battery capacity on this one (the manufacturer didn’t show this info) but we know that it can offer up to 7 hours of playback time at 60% volume, and probably 2-3 hours at maximum volume. Charging is relatively fast and it takes 1.5 hours. Like all the budget speakers, this one doesn’t have a great mic, but you can talk to the person on the other side without a problem. It is much easier to use the speaker indoors than outdoors because of all the environmental noise that mic picks up. For a 3W cheap speaker, RoverBeats T3 sounds amazing. We didn’t expect it to be that loud and that was the greatest surprise. On the other side, the sound quality is not great. There is some bass, but it is a little bit shallow, vocals sound clean, and highs lack intensity and crispness. There is perceptible distortion at maximum volume – you shouldn’t go above 80% if you want good balance between low, mid, and high frequencies and no distortion. For something you can buy for under $25, this speaker is well-built, but we are still not completely happy. The housing is decent enough, but the fact that RoverBeats T3 is not waterproof in any way is kind of a downer. You have to be careful and avoid any contact with water. Mpow is company specialized in audio gear (especially headphones and speakers) and car and phone accessories. Their headphones are maybe more popular than speakers, but there are some speakers made by Mpow that deserve to be mentioned. We are presenting to you Mpow Armor mini Bluetooth speaker for outdoor use. Mpow Armor comes in an original box, it’s nothing flashy, but it’s surprising to get original packaging with some cheap speaker (it’s usually simple cardboard box), and you can find this one for less than $25. Along with Mpow Armor, you will get micro USB charging cable, auxiliary tangle-free audio cable, instruction manual, and 18-month warranty. Mpow Armor can be considered a mini speaker because it is 5.1 inches wide, 3.1 inches tall, 3 inches deep, and it weighs only 10 ounces. You can take it with you wherever you go, and it will fit any bag. It has specific octagonal shape, and it is made of plastic combined with metal and rubber materials. The front and back are covered with aluminum mesh that protects the driver and passive radiator. The rest of the speaker is plastic, but the edges are reinforced with metal and rubber. Three control buttons are on the top – there are volume buttons (you can also use them to control the playback by long pressing) and power button (pairing start when you turn on the speaker, there is no pairing button). On the left side, there are two rubber flaps. The first one protects the micro USB charging port and line-in port, while the second one protects the one thing that really makes this speaker special and better than bunch of other mini Bluetooth speakers. This rubber gasket protects the USB port which you can use to charge your phone in case your phone battery drains out. There is limited amount of power available, but in some cases, this could be life-saving feature. Inside Mpow there is one 5W driver on the front side, and one passive radiator at the back. Mpow Armor has distinctive octagonal design, we have to give them some credit for that – whether you like it or not, it’s all up to you. It doesn’t look glamorous or stylish, but maybe that’s because of the colors. It is available in two color combinations – orange and black, and turquoise and black. The all-black speaker would probably look much better. Mpow Armor is compact and looks and feels pretty durable thanks to all the rubber and metal reinforcements. It is more rugged than many other speakers and we think it can survive heavy beating. On top of all that, it is water resistant and dustproof, so you can use it in many situations without worrying that it will get damaged. Mpow Armor exploits Bluetooth 4.0, pairing was quick and connection was stable all the time but only within some 15ft range (not 33ft like Mpow claims). We were able to pair this speaker with Android smartphone and iPhone without problems. If you have some non-Bluetooth device, there is line-in port available, but there is an issue regarding wired connection we are going to discuss later. Mpow doesn’t provide info on battery capacity, we only know it’s lithium-ion battery. In our experience, battery can offer up to 10 hours of playtime at 50% volume, and 3-4 hours at maximum volume. Recharge takes 2-3 hours. We have no idea if there is another battery inside the speaker, or there is only one battery, but what we definitely know is that you can use USB port to charge your phone in case of emergency and that is the greatest thing about this speaker. You have limited capacity of 1,000mAh available, so you won’t be able to fully charge your phone, but in some situations, this feature could be truly helpful. The speaker offers great amount of loudness, and we were honestly surprised with it. The sound quality is not that amazing. There is definitely some bass and you can feel it when holding the speaker in hand, mids are articulate, and highs are clean but they get muddy at higher volume. You can notice solid amount of distortion when you increase the volume above 80%. This can be a little bit annoying. If you use audio cable to connect the speaker and your device, the speaker will shut down every 30 minutes. The problem is that if you don’t use Bluetooth connection, the speaker thinks that you are not using it even if you press the volume buttons every now and then. There is still no solution for this problem. If you need your speaker to have built-in mic, then this is not the right speaker for you. We don’t think this is such a big issue, so we are just stating the fact. After all these cheaper models it’s a real refreshment to get to something that could be considered high-end product. First of that kind is made by SONY, the company we all know so well, and the company that is considered one of the pioneers in audio industry. We have already done a review of their mini Bluetooth speaker from the same series – XB10 in one of the previous articles, and this is another, slightly bigger speaker from that series – XB20. Hopefully, we will get to XB30 and XB40 in some of our future articles. Sony XB 20 comes in a nice Sony-branded box, and inside the box, there is the speaker, micro USB charging cable, and instruction manual. It is a little bit strange that you don’t get auxiliary audio cord when you can get it with much cheaper speakers. XB20 is considered a small speaker, it’s bigger than XB10 or UE Wonderboom that we reviewed in our article about mini Bluetooth speakers, and slightly smaller than JBL Flip 4 or UE BOOM. XB20 is 7.8 inches wide, 2.67 deep, 2.7 inches tall, and it weighs 1.3 pounds so it can easily fit any bag or you can hold it in your hand. Speaker is nicely shaped with rounded edges and rubber finish. The front is covered with strong metal mesh, and there is also smaller mesh covering part of the rear panel and protecting passive radiator. Around the mesh on the front panel, there is LED frame that glows and make a little light show when you turn on the speaker. It’s a really nice little detail that makes listening to music even more fun. At the top, there are 7 buttons which is much more than you could see on any of the previously mentioned models. From left to right, you will see EXTRA BASS button (in case you want better bass response, but honestly there is only small difference), handsfree button, play/pause button, ADD button (you can use it to connect 2 or more speakers in a system), volume controls, and power button. At the back panel, right next to the smaller aluminum mesh, there are line-in port, micro USB charging port, and reset button, and they are all protected with thick rubber gasket. Inside XB20, there are two drivers, one passive radiator in the middle, and one passive radiator at the back. Sony doesn’t provide any info on the drivers (wattage and other data) which is, just like the lack of audio cable, a little bit weird, especially when you know what kind of quality you can expect from Sony. XB20 is one of the best-looking Bluetooth speakers on this list. Maybe it’s best to say that it looks like a giant pill. Materials that were used make it look so stylish and elegant, and we are truly thrilled with its design, it’s simply loveable. XB20 is available in 5 colors – black, blue, green, gray, and red. The moment you see it and take it, you know that XB20 is made of the best possible materials. This speaker can definitely last for a long time. Rubber finish gives an extra grip and makes it resistant to some beating (although it is not really rugged). XB20 is also water resistant so it can survive strong water jets but not immersion in water. XB20 features Bluetooth 4.2 (we expected this one to be one of the first with Bluetooth 5.0 since it is 2017 model). Pairing is just like with all the other Sony speakers very simple and quick, and if you are an Android user, you can use NFC function for even faster pairing. The connection is stable even when you are some 40ft away from the speaker (good job, Sony), there is no cutting out and signal loss. The speaker works flawlessly with Android devices and PCs, while there is some kind of issue with Apple devices and the sound is not exactly the same like with other devices (we can’t say if this is an issue with our speaker or with every speaker, so it would be smart to try this speaker in some local audio store). If you have a non-Bluetooth device, there is aux-in port available, so you can connect the speaker with your device via audio cable (but you need your own cable because there is no cable in the box). Sony doesn’t offer any info about battery, so we have no idea what’s the capacity, but we can tell that battery will last for 10-11 hours at 50% volume or 4 hours at maximum volume. Battery drains out faster if the lights are on, and we have measured the time with lights on. It takes 3-4 hours to fully charge the battery. Unlike all the previous speakers on the list, you can connect two XB20 speakers to get true stereo sound. If you have two XB20 speakers, you can pair them by pressing ADD button on both of them simultaneously. You can also pair up to 10 XB20 speakers into a ‘’party chain’’ (that’s the name Sony came up with), and start the party in seconds. Songpal app (it is now renamed to Sony Music Center) which you can use for some limited setup. You can use it to turn off auto shut down, enable Bluetooth standby mode, and change the light show mode – you can choose between strobe, chill, and rave mode. Taking calls with this speaker is pretty good if you are 5ft away from the speaker. If you are more than 5ft away, your voice gets really quiet on the other end. When it comes to the sound quality, XB20 is very good and can be compared to the JBL Flip 4 (which is a little bit more expensive but has IPX7 waterproof rating). The bass is punchy and doesn’t get distorted even at high volumes. Extra Bass button, brings just a little bit more bass, and it is definitely not overwhelming. For its size, we think the bass is perfect and if you want stronger bass, then you should buy some bigger (and more expensive) speaker. The midrange is where XB20 excels – vocals are super-clean and crisp and the reproduction of all the other sounds from the midrange is sharp and detailed. Highs are not perfect, and they should be a little bit crispier, but the overall impression is that XB20 offers great sound quality for the price and for its size. The sound separation between the right and left channels is maybe the biggest issue (the same thing with all small Bluetooth speakers), but if you buy two speakers you can make much better separation. The instruction manual for XB20 looks really awful, and you can’t find out many things by reading it. That’s why we are going to give you some instructions. Press and hold speakerphone button to get battery status, or press and release to activate Siri or Google Assistant. Press twice or three times play/pause button to skip backward or forward. Single press power button to turn on the speaker, long press to start the pairing. This is one annoying issue – in order to preserve the battery, the speaker automatically lowers the volume when the battery level is below 25% and there is no way to prevent this from happening. You will have to press volume up button all the time and hope that you will win (but you won’t). Since we’ve already mentioned AOMAIS audio company, we won’t repeat all that. Just like the previous AOMAIS speaker on the list, this one is also affordable, a little bit bigger and stronger, but still not too expensive. If you love strong bass, and you are not quite happy with all those smaller speakers we’ve reviewed earlier, this one might be great for you, especially if you don’t want to spend too much money. AOMAIS GO comes in an original AOMAIS box, unlike many other cheap (or affordable) speakers. On the box, you can read about some of the highlighted features and see the big picture of what’s inside. Inside the box you can find the AOMAIS GO speaker, auxiliary audio cord, micro USB charging cable with proprietary wall adapter, carrying pouch (which seems kind of unnecessary, because when something is this large, you probably won’t put it in a bag, you will just grab the handle), instruction manual, and warranty. 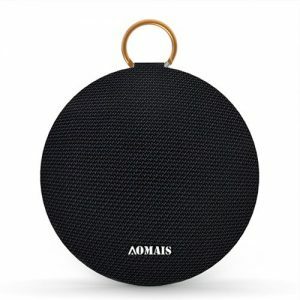 AOMAIS offers 1-year warranty for this speaker. The speaker looks very rugged and sturdy, many parts are reinforced, and there is nice rubber cover protecting the whole speaker, except the back and rear panels (there is black metal mesh protecting the drivers and passive radiators on the front and rear panels). The speaker is definitely not small like most of the previous ones, but it’s not really that big. It weighs 4.2 pounds, so even a child can carry it around. The size might be a problem for some people because you can’t really put it in your bag – it is 13.5 inches wide, 3.8 inches deep, and 7.5 inches tall. Fortunately, the speaker has strong, rubberized handle so you can grab the speaker and bring it with you to the pool or the beach. 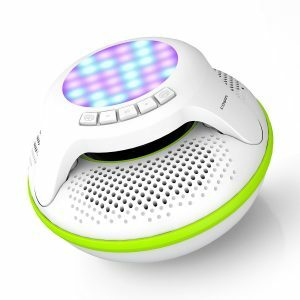 There are four control buttons above the front metal mesh – power button, volume controls (can be used to change tracks), and play/pause button, which is also a speakerphone button in case you want to take calls with this speaker. You will also see two rubber gaskets – one on the left and the other on the right side. The one on the left side protects the charging port, line-in port, and USB PowerBank (you can use it in case you need to charge your phone). Rubber gasket on the right side protects mic-in port and mic volume controls. AOMAIS GO has two 15W strong drivers with two additional passive radiators for better bass response (one at the back and one between the drivers on the front). We didn’t have any speaker of this kind on the list, but this is definitely not one of a kind in terms of design. The market is flooded with boombox-like speaker, they can be bigger or smaller, edges can be rounded or straight, but the basic shape is the same. So, if you don’t like this type of speakers, you probably won’t like this one, and if you find it attractive and interesting, then you should know that you can choose between black, blue, and red (AOMAIS says that’s orange, but we are pretty much sure that it is red). 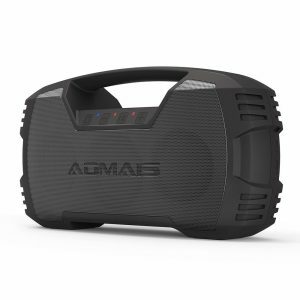 AOMAIS GO is very rugged, we have already mentioned the reinforcements, the rubber finish, strong metal mesh, so you probably understand how strong and durable this speaker is. It can definitely take some beating. On top of all that, AOMAIS GO also has IPX7 waterproof rating, so you can take it to the pool and be worry-free because it won’t get damaged by splashes of water. AOMAIS GO features Bluetooth 4.2, which functions great with all phones (Android and iPhones), PCs, tablets, basically with everything that has Bluetooth. The range is standard 30ft, and we haven’t noticed any Bluetooth-related issues. The playback is continuous if you stay within the range and signal is strong all the time. There is also line-in port if you have a non-Bluetooth device. If you want better audio separation (although AOMAIS GO offers better separation between left and right channels than all the small speakers we’ve mentioned previously), or if you want to make a party and you need louder sound, you can buy two AOMAIS GO speakers for around $100 and connect them via Bluetooth. Pairing two speakers is basically the same like with AOMAIS Ball, and it is a little bit complicated. Since there is no ADD button (like with XB20, for example), you have to unpair the speaker you’ve been using and turn it off, then turn both speakers on and wait for them to pair with each other. After that, you can use your phone (or any other Bluetooth device) to pair with the master speaker, you just have to guess which of the two speakers in your list of Bluetooth devices is master speaker (they are both named the same). We don’t like the pairing process, and you could probably conclude that from this short explanation. Besides the sound, this is the best feature of this speaker. AOMAIS GO has very large battery with rated capacity of 7,200mAh, and that’s a lot. That’s why you can use this one to charge your smartphone and play the music at the same time. Of course, if you decide to do that, the playback time will be shorter. If you don’t use USB PowerBank port, you can listen to music for up to 30 hours at 50% volume, but only 6-7 hours at maximum volume. Recharge is pretty fast (3-4 hours) because you can use wall adapter, and it would take much longer if you would have to connect it to some USB port (like all those small speakers). When the speaker is bigger, you have the possibility to involve more additional features. We’ve already said everything about USB PowerBank port, so we won’t repeat that but this is great and very helpful feature. The handsfree function is pretty standard addition, it works fine, but if you move more than 5ft away, your voice becomes very quiet. Mic-in port is not something you can see often in a speaker, but it is nice little addition to have, just in case you or somebody you know is crazy about karaoke. Unfortunately, you will have to buy microphone separately. AOMAIS GO is definitely louder and has better audio separation than all the previous speakers on the list, but after all, they don’t compete in the same category (unless we are talking about the price or about Bluetooth connection). GO is bass-oriented speaker, and in terms of sound quality, this is its best characteristic. Vocals are pretty clean, but highs are not crisp and detailed enough, but considering the price, you will be happy with this one. Sometimes you really have to press the control buttons harder to get some response. It doesn’t happen always, it’s not like the buttons are stiff or anything, but the issue is there from time to time. We have already explained this issue in one of the previous sections (you can also read detailed explanation in our review of AOMAIS Ball). Although Anker is not one of the biggest players on the market, it already has great fan base, and there is a big reason for that – Anker’s products are usually affordable and offer surprisingly good quality for the price. Anker Soundcore Sport XL is improved version of much smaller Soundcore Sport version and it is a little bit more expensive, in fact, it is one of the most expensive Anker speakers. It is in the same price range like JBL’s Flip 3 or Charge 2 (Charge 2 is better for comparison because it features USB charging port just like SoundCore Sport XL) and we will make some comparisons between these speakers. SoundCore Sport XL comes in a very stylish, premium packaging. 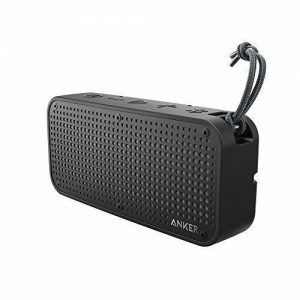 Inside this Anker box, you will find instruction manual, micro USB charging cable, nylon strap that you can attach to the speaker, and 18-month warranty. There is line-in 3.5mm port on the speaker but you won’t get auxiliary cord. 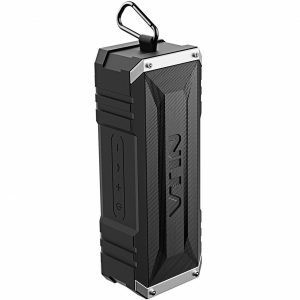 SoundCore Sport XL is very sturdy, rugged, brick-like speaker. The speaker is heavier than it looks, but it is still very much portable – it weighs 21.2 ounces, it is 6.9 inches wide, 3.1 inches tall, and 1.7 inches deep. The front side is completely protected with strong metal mesh, and underneath the mesh, you can see the fabric that protects the drivers and makes the speaker waterproof. The speaker is completely made of hard plastic, with thick rubber finish that covers everything. At the back, you will see long rubber gasket. The gasket is very well sealed and we’ve struggled to remove it. This gasket protects micro USB charging port, line-in 3.5mm port, and USB charging port (in case of emergency you can use it to charge your phone). There are five control buttons on the top – power button, two volume control buttons, play/pause button, and Bluetooth button. In the top right corner, there are 4 LED lights and a short metal bar. The upper LED light is Bluetooth indicator, while the other three lights are battery level indicators. You can wrap nylon strap around metal bar and hang your speaker wherever you like. SoundCore Sport XL has two 8W drivers and two passive subwoofers (one on the front and one at the back). The speaker looks like a brick with rounded edges and corners. Everything about the looks implies that it is designed for outdoor use. Black color, visible screws, and strong metal mesh give somewhat of an industrial vibe to the speaker. SoundCore Sport XL is available in only black color. Just like we’ve said, the moment you see and touch the speaker, you will know that it is intended to be used outdoors. Everything is well-sealed, rugged, with rubber cover, and sturdy metal parts. It has IP67 waterproof and dustproof which makes it perfect choice for all the active people. You can bring it literally everywhere with you – beach, pool, campsite. It will survive all the rigors of everyday outdoor use without any problems. Sport XL features Bluetooth 4.1 and has extended range. The range is not exactly 66ft like the manufacturer claims, it’s more like 40ft, anything further than 40ft will cause signal loss. Pairing is simple and it doesn’t start automatically, but you have to press Bluetooth button after you turn on the speaker. Pairing is very simple and quick, and Bluetooth works with all Bluetooth devices. You can also use line-in port if you have some non-Bluetooth device, but you will have to buy an audio cable. Sport XL has pretty large battery (5,200mAh) for its size, and you can even use this battery to charge your smartphone in case of emergency. The battery offers up to 15 hours of playback (if you don’t use USB PowerBank port) at 50% volume, and 5 hours at maximum volume. Having USB PowerBank port is something we love about this speaker. It is very useful and can be real lifesaver in some situations. The speakerphone is pretty much standard feature on all the Anker speakers, it is decent when you are near the speaker, but it is definitely better to use your phone to make or answer calls. Anker’s priority was ruggedness and durability, not the sound. We can’t say that it sounds bad, but it is far from great, even for its size. SoundCore Sport XL offers well-balanced sound, with unimpressive amount of bass, very articulate mids (vocals are definitely the main highlight), while the highs are not as clean as we would like them to be. 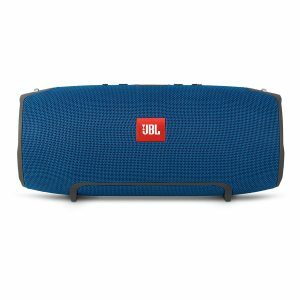 If you love bass-heavy sound, you should probably go for JBL Flip 3 or JBL Charge 2 (the same price range like Sport XL). If you like flat frequency response, then Sport XL is better option. Anker made very rugged and durable speaker, and it is a real shame that they didn’t pay much attention to the micro USB port. The plastic around this charging port is a little bit thinner and it breaks easily, so you should be careful with the speaker when charging it. A certain number of customers complained about this issue, and we think you should know that. If this was a cheaper speaker, we wouldn’t consider this a flaw, but for this kind of money, we think it’s only natural to expect NFC function. Tronsmart is probably more famous for its chargers, Powerbanks, cables, and hubs, and it only recently (in 2017) started its audio line. One of the first speakers made by this company is T6. This is another cylindrical speaker on the market, it looks like more popular JBL or UE speakers, but it is slightly modified to look like thermos or a bottle. There are some very similar speakers on the market – the best examples are Enusic Soundcup, TaoTronic TT SK11, or Treblab HD55, and we assume that they all came out from the same factory. Tronsmart T6 comes in original Tronsmart box, it’s nothing flashy or super-stylish, but it’s decent and better than simple cardboard box. Inside the packaging, you will find T6 speaker, micro USB charging cable, auxiliary audio cord with 3.5mm jacks, and instruction manual. There is also 1-year warranty. T6 is completely covered with protective woven grille that looks a lot like the mesh on some waterproof models (like JBL’s and UE’s speakers) but it’s not really waterproof. At the back, there is thin rubber spine with Tronsmart logo at the top and rubber flap at the bottom that protects micro USB charging port and aux-in port. The bottom is also covered with rubber to prevent moving. The control buttons and volume knob (or wheel) are on the top. There are five control buttons – play/pause button is in the middle (you can also use it to disconnect Bluetooth by long pressing), and around it, there are forward/backwards buttons, power button (press it long to shift between line-in and Bluetooth or short to turn it on or off), and speakerphone button (short press to answer or end call, long press to redial the last number). Inside Tronsmart T6 there are two 48mm drivers with rated power of 12W each, and one passive radiator. This is the perfect speaker for those who love JBL and UE speakers but aren’t prepared to pay that much. Cylindrical (or bottle) shape is nothing new or authentic, but it is still visually appealing and attractive. T6 is available in 2 colors – black and red. This is the feature that confuses us the most. Although it looks and feels very rugged and durable, the manufacturer doesn’t claim anything. It doesn’t even mention the build quality. We think that it could withstand some beating, but don’t experiment. We don’t have any info on Bluetooth version, but everything seems usual. It is compatible with wide variety of Bluetooth devices (iPhones, Android phones, PCs, tablets, etc. ), range is approximately 20ft (not 30ft like the manufacturer claims), connection is stable, no cutting out. If you have an mp3 player without Bluetooth you can connect the speaker and your player via audio cable. The battery is the best feature of T6. It has 5,200mAh capacity, and you can listen to music for up to 15 hours at 60% volume, and 6-7 hours at maximum volume. Recharge takes 3-4 hours and you can use any USB port on your PC or laptop (or Powerbank brick if you have one) to charge it. The handsfree function works fine, you can hear the person talking to you, and that person can hear you well if you are within 5ft range. Still, it is definitely better to use your phone to answer/end calls. T6 is very heavy on bass, probably too heavy. Anything above 70% volume will cause significant distortion, especially in the low end. Mids sound articulate but bass often drowns them. Highs are clean up to 85% volume, and then there is some distortion in the high end, but not so noticeable like with bass. Everything sounds much better and more balanced at 60% volume or lower. Although it looks like some popular waterproof speakers, there is absolutely no info about waterproofness. The first thing we assumed when we opened the box was that it is at least splash-proof, but Tronsmart doesn’t make that kind of claims. There is protective woven fabric, there is rubber gasket protecting the ports, but we can’t say that it has any kind of IPX rating. Although Tronsmart says that you will get 360-degree sound experience, that’s not quite true. You can hear the sound from every angle, but the sound is definitely not equally distributed, and you won’t hear the same output from every position. Well, it’s really hard to make a list of the best outdoor speakers and not mention some of the most popular brands like JBL and UE. We have reviewed some UE models in our previous articles (BOOM 2 and WONDERBOOM), and now it’s time to present to you UE’s largest and loudest Bluetooth speaker from BOOM series – UE MEGABOOM. The sound is the biggest feature of this little monster, but there is so much more. Keep reading our review to find out everything about this speaker. Like all the other UE speakers, MEGABOOM comes in a really stylish packaging. Along with MEGABOOM, you will get yellow micro USB charging cord and wall adapter (yellow is signature color for UE cables), instruction manual, and 2-year limited warranty (standard warranty period for all the UE speakers). MEGABOOM is absolutely the same like BOOM or BOOM 2, only bigger. It is 8.9 inches high, diameter of the base is 3.3 inches, and it weighs 1.9 pounds. The biggest part of MEGABOOM is covered with protective waterproof skin, while the bottom and top are rubberized, as well as the thick spine on the back. Power button and Bluetooth button are on the top, and at the bottom, there is a rubber gasket protecting line-in port and micro USB charging port. In order to remove the gasket, you have to remove D-ring (which is in the middle of the bottom part). D-ring goes into tripod mount and when you remove it, you can mount MEGABOOM on bunch of different devices. Two volume control buttons are located on the rubber spine, and if you press them together you can hear the battery status. Inside MEGABOOM, there are 2 drivers and 2 passive radiators. We would have to disassemble the speaker to find out what’s the output power, but it is stronger than any portable speaker we mentioned previously. If you like any other UE product from the BOOM line-up, there is no reason not to like this one. The shape is absolutely the same, and the other thing that you always get with UE speakers is bunch of different editions. You can choose between black, charcoal black, charcoal black with yellow details, electric blue, lava red, galaxy, and plum edition. MEGABOOM is very strong and rugged, protective fabric is absolutely inflexible, and rubber parts are so strong. MEGABOOM seems almost indestructible, some people even let their dogs chew the speaker, and MEGABOOM survived. This is also a waterproof product with IPX7 rating. It doesn’t float, but it won’t go straight to the bottom if you accidentally drop it into the pool so you will have enough time to grab it. MEGABOOM features Bluetooth 4.2 with extended range. Advertised range is 100ft, and that’s pretty much true if there are no obstacles. If there are walls, trees, or anything else, the range shortens. You can pair MEGABOOM with any Bluetooth device, and there is also line-in port in case you have some non-Bluetooth device. You can pair the speaker with 3 different Bluetooth devices at the same time and take turns with it. MEGABOOM can remember 8 different Bluetooth devices that were previously paired with it. NFC pairing is also possible (only for Android users). In order to get more from MEGABOOM speaker, you can download MEGABOOM app. The app allows you to pair two MEGABOOM speakers, adjust the EQ (choose one of four presets or make your own settings), set the alarm, or change the language of voice prompts. If you want louder sound, you can pair up to 150 MEGABOOM speakers and start an incredible party (it’s not like you are going to pair even 3, considering the price). If you have two MEGABOOM speakers you can get not only louder sound but much better stereo separation. Unfortunately, many customers complained about this function. You are supposed to do this via app, but the app doesn’t always work. You can read more about this issue in our ‘’Things we don’t like’’ section. MEGABOOM has the largest battery of all the speakers from BOOM series. There is no info on capacity, but UE claims that you can get up to 20 hours of playback at 50% volume (in reality up to 18 hours, which is still amazing considering the quality of the sound and loudness). At full volume, you will get 7-8 hours of playback. Recharge takes 4-5 hours. If you liked the sound of much smaller BOOM 2, then MEGABOOM will blow you away. For its size, MEGABOOM really sounds amazing and well-balanced. The speaker is not heavy on the bass side, and maybe it should have just a little bit more bass. On the positive side, bass doesn’t get distorted at all, even at high volumes. Mids and highs are super-clean. Everything sounds very natural, and it can’t get much better with a speaker of this size. Some customers complained that they can’t set two speakers to act as left and right channel by using app. There is workaround for this issue, and there is no need to use the app, but it is pretty complicated. You have to turn off both speaker and your phone for a minute, then turn on phone and one speaker and pair them. After that, you can turn on the other speaker, and then (this is the tricky part), you have to press Bluetooth and + button on one speaker and press twice Bluetooth button on the other speaker. Some customers experienced one more problem with MEGABOOM – after some time, usually a few months, MEGABOOM becomes unable to connect with Bluetooth devices. This is not a common issue, less than 1% of people complained about it. In our opinion, this is the biggest problem about MEGABOOM. It simply costs too much, but if the money is not an issue for you, you should definitely buy it. Also, if you get some great discount (like 50%) don’t hesitate, you will not regret. JBL is the other big player that you always expect to see on lists like this one. And it would be a mistake not to include at least one JBL’s speaker on the list. We’ve chosen JBL Xtreme since it is in the same price range like our previous MEGABOOM speaker (in fact, it is a little bit cheaper) so we can compare these two during the review. These two speakers can’t be compared with all the other smaller speakers since the price range, as well as the size, are not the same. You could say that this part of our article is for those with significantly bigger budget and for those who want more powerful sound packed inside something that is still portable and at least weatherproof. 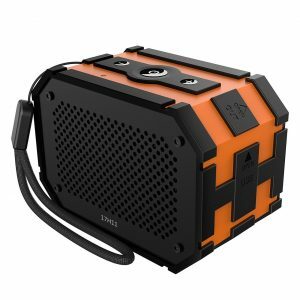 In terms of sound quality, JBL Xtreme is probably the best portable outdoor speaker on the market. If you like big, powerful sound with lots of mind-blowing bass, Xtreme is the best out there, and it can be yours for less than $200. Presentation of the JBL Xtreme, just like the presentation of MEGABOOM, is simply amazing compared to all those small and cheaper speakers we’ve mentioned earlier. Inside the JBL packaging, you will find one JBL Xtreme speaker, power cord with big power brick and wall adapter (you won’t get micro USB charging cable like with smaller speakers), heavy-duty carrying strap with strong metal hooks (you can attach it to the speaker and hang it over your shoulder), and instruction manual. You don’t get auxiliary cord but there is line-in 3.5mm audio port, and you will have to buy this cable separately. JBL Xtreme speaker is pretty chunky, it is significantly larger and heavier than MEGABOOM – it is 9 inches wide, 5 inches tall, and 4.8 inches deep and it weighs 4.7 pounds (it is more than twice as heavy as MEGABOOM, and they are still in the same price range). The first thing you will notice when you take it out of the box is that it is very sturdy and very rugged. The whole body is protected with nylon-like braided fabric, and at the left and right ends there are two huge passive radiators. On the top, there are 6 tactile buttons – Bluetooth button, volume controls, play/pause button (can be also used as handsfree button or for changing track – double click for the next song, triple click for the previous song), and in the middle, there are power button and JBL connect button (if you buy two Xtreme speakers you can connect them by pressing this button). At the bottom, there are two large rubber feet (they prevent speaker from moving due to heavy bass) and a strong orange zipper that protects all the physical connection ports. Behind the zipper, there is one micro USB port (for firmware updates), line-in 3.5mm port, 2 USB Powerbank ports (you can charge two of your devices simultaneously thanks to very large battery), and charging port. Inside the JBL Xtreme, there are two 35mm tweeters that provide output power of 40W, and there are also two 60mm woofers. Xtreme is not really different from all the other JBL Bluetooth speakers – basically the same shape, just larger. So, if you like JBL Flip, or JBL Charge (or even any speaker from the UE BOOM series), you will like this one, too. JBL doesn’t make as colorful speakers as UE, and you can choose between camo, black, red, or blue model. Xtreme is rugged and looks very durable, braided protective fabric is very strong and it doesn’t move or flex no matter how strong you press it. Parts, where passive radiators are located, are maybe a little bit less rugged than rest of the speaker, but general impression is that Xtreme is made to withstand heavy use. There is also IPX4 splash-proof rating, so rain or water won’t damage it, but it probably won’t survive submersion. This is probably the only aspect where MEGABOOM is actually better than JBL Xtreme. Xtreme features Bluetooth 4.1 with standard Bluetooth range of 33ft. Pairing took 5 seconds, and the connection was stable and without signal loss. The speaker works with all kinds of Bluetooth (iPhones, Android smartphones, PCs, etc.) and non-Bluetooth devices (mp3-players). We didn’t notice any kind of connectivity or compatibility issues. If you decide to buy 2 Xtreme speakers, you can connect them for louder sound by pressing JBL connect button, or by using JBL connect app. The app is offering more options and you can choose whether you like your speakers to act as left and right (in order to get nice stereo separation), or you want them to play the same source (this is called party mode). JBL Xtreme features incredibly large battery with 10,000mAh capacity. It can offer you up to 15 hours of playback at 55-60% volume, and some 7-8 hours at maximum volume, which is amazing for such a big speaker. Recharge takes 3-4 hours thanks to the charger with wall adapter (charging this monster via USB would last much longer, and that’s why JBL decided to go with this big brick-like charger and wall adapter). Thanks to its huge battery, JBL Xtreme can charge two devices at the same time through its 2 PowerBank USB ports. Of course, if you decide to charge your phone through one of these ports, the playback time will be shorter. JBL claims that Xtreme has built-in speaker with echo and noise canceling technology. The speaker really does better job than all those smaller ones and it is also better than MEGABOOM, but it is still not great. This is just an additional feature, it’s not like you are buying speaker just because of the speakerphone function, but you should know that it really works. This is definitely the most impressive feature. This speaker sounds much better than all the competitors in this price range. Xtreme makes UE MEGABOOM sound like its baby brother. The amount of bass is incredible, and the fact that there is practically no distortion even at maximum volume is mind-blowing. Every tone coming out of this speaker is incredibly full and accurate. Mids and highs are right on the spot, clean and articulate, but still, the bass is definitely the greatest highlight. The sound is nicely distributed in all directions so you will also get 360-degrees sound experience. It doesn’t hurt to say this again – if you like bass heavy music, forget about Beats Pill XL, MEGABOOM, and all the other speakers, JBL Xtreme is the best choice. NFC function is underestimated by some manufacturers, but it is, in fact, very useful for Android users, and we think that every device that costs as much as JBL Xtreme should have this function. 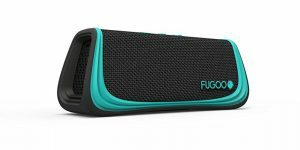 FUGOO is one of the new players on the Bluetooth speakers market, but it has already become very popular, especially among the active people (sportsmen, fishermen, rock climbers, etc. ), partially because of the marketing and partially because they really make durable and sturdy speakers that could withstand all kinds of extreme conditions. We are presenting to you their FUGOO Sport Speaker, which is basically they original core speaker with Sport jacket (or sleeve), but we will talk about jackets and other accessories later. FUGOO worked hard on the presentation and you can see that the moment you get the box. It’s really nice and stylish. Inside the box, there is FUGOO core speaker with Sport jacker (the speaker is screwed to the plastic platform – the basic idea is probably to show that you can attach it to different surfaces), auxiliary cord with 3.5mm jacks, micro USB charging cable with detachable wall adapter, and instruction manual. The speaker is shaped like triangular prism. It’s not really the unique shape, but it is interesting. FUGOO Sport is rather small and lightweight – it’s 9 inches wide, 4 inches deep, 4.7 inches tall, and it weighs 1.1 pounds. The core unit itself is very rugged and strong. It is made of hard industrial plastic, combined with metal parts. Sport jacket provides additional protection and makes the speaker much more visually appealing. On the right side, there are power button and Bluetooth pairing button, and on the top, there are volume controls and play/pause button (also a handsfree button). On the left side, you will find two ports – micro USB charging port and aux-in port. The sport sleeve is made from some braided rubber-like material, which looks like the skin on any waterproof UE or JBL Bluetooth speaker. Inside the speaker, there are two tweeters, two woofers, and two passive radiators, but the combined output power of 6W is not impressive. Well, you already know about the shape of the speaker. The core unit is not really that pretty, but that’s why you have sport jacket. You can also buy some other jackets separately, and you can choose between two style jackets (red or silver) and tough jacket (which looks like some kind of cage). This is the first important thing that makes FUGOO Sport speaker special. The very core unit is very strong and capable of surviving beating, throwing, kicking, water, snow, rain, and many other punishments. It is completely waterproof and dustproof, so you can bring it to the beach with you and not worry at all. We are truly impressed by this speaker’s durability, there is no doubt that it is made from high-quality materials (especially the exterior). FUGOO Sport features Bluetooth 4.0 with pretty much standard range of 33ft without obstacles. It takes up to 10 seconds to pair speaker with a Bluetooth device and start streaming the music. We haven’t experienced connection issues, although the range is not perfect, and you should probably stay within 15ft range. For non-Bluetooth devices, there is line-in port and proprietary audio cord. This is the second great thing about FUGOO Sport. We don’t know how large is the battery, but you can stream your music for incredible 40 hours at 50% volume. This would be even more amazing if the drivers were more powerful. Since the drivers have combined power of 6W, you will probably have to increase the volume and listen to the music at much higher volume. At 100% volume, you will get up to 15 hours of continuous playback. It takes 3-4 hours to fully charge the battery (if you use wall adapter). FUGOO Sport has speakerphone so if you are on your bike, or if you are hiking and you have to use your hands, you can answer calls through the speaker. Built-in mic works pretty well, but standing 5ft or further from the speaker makes the conversation very difficult (your voice will sound like you are talking from much greater distance). There is bunch of accessories that you can buy for this speaker, but you won’t get any of them along with the speaker. There are all kinds of mounts (bike mounts, multi-mounts, strap mounts), jackets (STYLE and TOUGH), and even a remote control that you can wear around your hand. Unfortunately, you will have to spend additional $150 dollars, which is kind of too much, at least that’s what we think. If you like strong and bass-heavy sound, this is not the speaker for you. FUGOO offers well-balanced sound with pretty much flat frequency response. There is no distortion even at maximum volume, but the sound is not full enough, or detailed enough. In short, FUGOO Sport has decent sound, but you can find much better-sounding speakers in this price range. FUGOO paid much more attention to the ruggedness, durability, and battery longevity than to sound quality and loudness. You can’t expect something with an output power of 6W to be incredibly loud and FUGOO Sport is pretty quiet even for a 6W speaker. Some features, like price and sound quality, are important when buying any speaker, but if you need something for outdoor use, you will have to take a closer look and read about materials that were used and about battery durability. These are crucial features for any outdoor speaker. Also, you will have to read about connection quality and compatibility since you are looking for a wireless speaker. Additional features like speakerphone and auxiliary input are not as important as previously mentioned, but some people like having them, so if you are one of them, read about those, too. Our reviews, just like bunch of other reviews online, are there to help you pick the right speaker for your needs, so read them carefully in order to make the right choice. If you have the opportunity, you should also try the speaker you want to buy – go to the nearest audio store and ask a salesman to show you the speaker. Durability is very important for outdoor speakers. Speakers with plastic housings are not the best option for outdoor use – you should be looking for rugged speaker, made of thick industrial plastic combined with rubber or silicone. Rubber or silicone can make the speaker shockproof and weatherproof, so you don’t have to worry about rain or drops of water damaging your speaker. If you have the money, you should be looking for waterproof speakers (with IPX6 or IPX7) rating. Waterproof speakers usually have additional protective layers and the drivers are also protected with some kind of fabric or thick grille, but because of all those reinforcements and protective layers, they also cost more. For hiking, cycling, or chilling in the park you will be fine even with non-waterproof speaker or with a speaker with lower IPX rating (IPX4 or IPX5), but if you want to bring your speaker with you to the beach or to the pool, you will need better waterproof rating, just in case. Since you are going to use the speaker outdoors (that’s why you are buying it), it’s only natural to assume that there will be no power outlet at all times. That’s why you need large battery that allows long playback time. Depending on the size of the speaker (size and number of tweeters and woofers) the same battery will last longer if the speaker is smaller. Also, battery life depends on the volume level, so don’t take for granted all those numbers you see in commercials. When the manufacturer says that battery can offer a certain number of hours of continuous playtime, you should check the volume level at which the manufacturer conducted measuring. Or you can read our reviews since we always specify battery life at certain volume (usually at 50% volume). If you are interested in wireless speakers, you have to check the connection quality and strength of Bluetooth/Wi-Fi signal. Nobody wants a speaker that won’t work flawlessly unless you are 3ft away from it – that’s why you don’t want wired speaker. 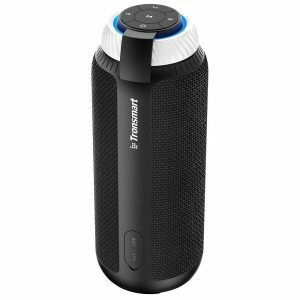 The usual range for Bluetooth speakers is around 30ft (that’s the advertised range, while in reality, it’s usually around 20ft), but there are also some Bluetooth speakers with extended range (up to 60 or 100ft), and some of them are on our list. The situation with Wi-Fi speakers is better when range is concerned, and you can be as far as 300ft away from the speaker and still get uninterrupted playback. Unfortunately, you can use wi-fi signal only around your house or in your backyard, wi-fi speaker is useless if you are away from your home. Only Bluetooth speakers or Wi-fi speakers with enabled Bluetooth functionality can come in handy in those situations. Whatever the purpose is, one thing never changes – we all want a speaker that offers strong and clean sound, punchy bass, crisp vocals, and super-clean highs. Of course, you can’t always expect that, especially if you are not prepared to pay a lot. Basically, you get what you paid for, and you can’t expect from some small $30 speaker to be perfect, that’s unreasonable, Fortunately, there is always a chance to save some money and still get more than decent sound quality. That’s why we make lists like this one. Additional features are very important for some people and absolutely irrelevant for others. We have tried to emphasize all these features, just in case. Bluetooth speakers often have speakerphone function, and that’s a must-have for some people. Some other features, like additional inputs (AUX, PowerBank USB port), are much more important and could really come in handy (at least, that’s our opinion). We are talking about the price in the end, but this could easily be the first thing to discuss. Unless you don’t have to worry about the budget, the price is of crucial importance. So how much money should you spend? If you really want something cheap, you can find a Bluetooth speaker for $15-$30 (NEWBEING S5, AOMAIS Ball, Etekcity RoverBeats T3, Mpow Portable, DOSS Touch), but don’t expect perfect sound quality, great battery life, or excellent build quality. You will get a decent speaker at best. 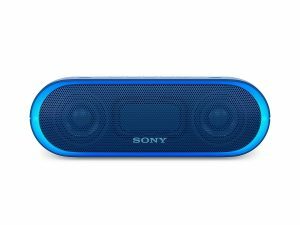 For $40-$80 you can buy really good and durable outdoor Bluetooth speaker (Sony XB20, AOMAIS GO, Anker Premium, Tronsmart T6), but if you want some of the most famous brands on the Bluetooth speakers market (like JBL, UE, Harman/Kardon, Bose, etc.) you will have to pay at least $100 (the prices go up to $250). I order Aomais Go two years ago and I am very satisfied with this speaker. This speaker have many advantages : It’s not expensive, the volume is not bad, very easy to connect with my Samsung galaxy s7 edge, battery lasts for a long time…..
With $120 in my pocket what speaker can I buy? Can you recommend me some of the best models on this list please? There’s a lot of competition at $120 price tag. If you are looking for something very durable and rugged, you should try the old MEGABOOM (the upgraded version is priced around $170) or the BOOM 2. If you want something equally rugged with Powerbank port, check out the JBL Charge 4. If you like speakers with lights, try XB20 or add 20 bucks and buy JBL Pulse 3. Our favorite is the UE MEGABOOM.